Established in 1999 on the outskirts of Edinburgh, Diggin Furniture are specialists in the design, creation and installation of bespoke furniture for both corporate and private clients throughout the Lothians and beyond. 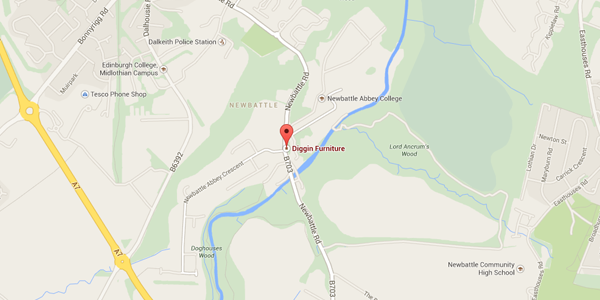 The workshop is nestled in Lord Ancrums wood within the beautiful grounds of the Newbattle Abbey. The owner of the business, Sean Diggin, is himself a highly skilled woodworker and designer having over 20 years experience in the business. Clients range from private domestic customers, interior designers and architects to The Royal and Ancient golf club of St. Andrews. The team of talented and skilled craftsmen, based at Sean’s workshop in Eskbank, can help you plan, create and realise the furniture of your dreams. In fact, custom made pieces from Diggin furniture already adorn the bathrooms, bedrooms and offices of many homes and businesses in Central Scotland. However, truly bespoke furniture is just that, made to commission and Diggin’s ability to design and create pieces in almost any conceivable form can lead to some very interesting and unique projects. Every project is treated with the individual care and attention it deserves, so whether you are seeking a woodworking service to create a one-off bookcase for your study or are searching for a company to design and craft a hand-built kitchen – why not give Sean a call?